Husk corn, remove silk and cut each ear in half. Use metal skewer or ice pick to make a hole through center of one end of each piece of corn. 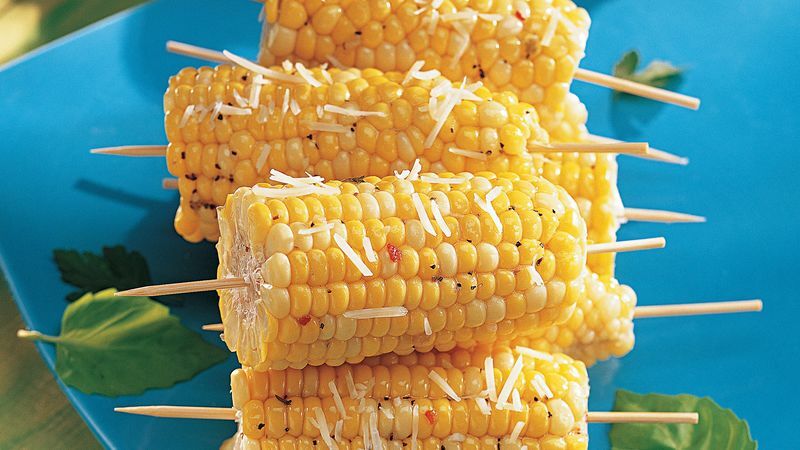 Insert bamboo skewers through corn. Brush corn with Italian dressing. Place corn in rectangular microwavable dish, 11x7x1 1/2 inches. Cover with plastic wrap, folding back one corner to vent. Microwave on High 9 to 14 minutes, rotating dish 1/4 turn every 5 minutes, until tender. Let stand 5 minutes. Sprinkle with cheese before serving. Rely on frozen ears of corn for year long enjoyment. Refrigerate unhusked corn until ready to use. Corn is best when eaten as soon as possible after picking. Husk ears and remove silk just before cooking.